Update your personal information, change settings, or change the layout of your calendar. 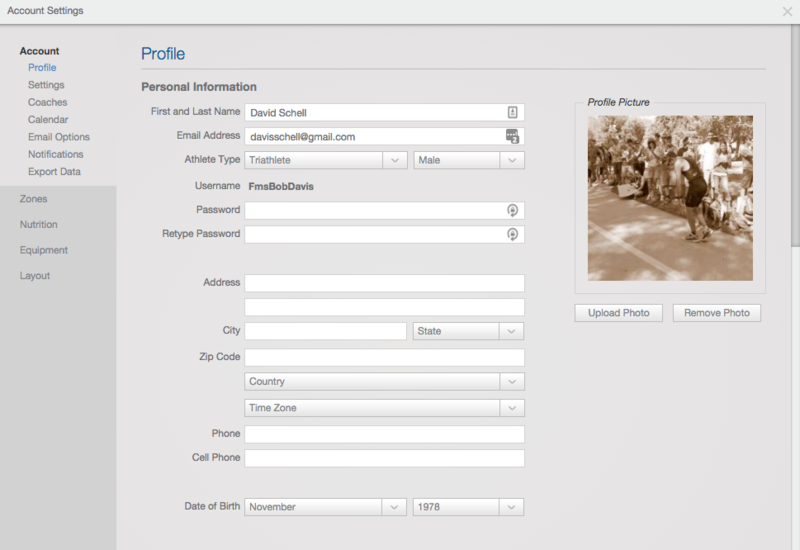 Update your personal information, upload a profile photo, or change your password. View your current account type, update your payment information, or change your unit preference. View which coaches you are currently attached to or shared with, request a new coach, or share yourself with a coach by entering their email address. Receive an email with your upcoming workouts, change the delivery time, and/or opt in for the TrainingPeaks newsletter to stay up to date on the latest features and happenings! 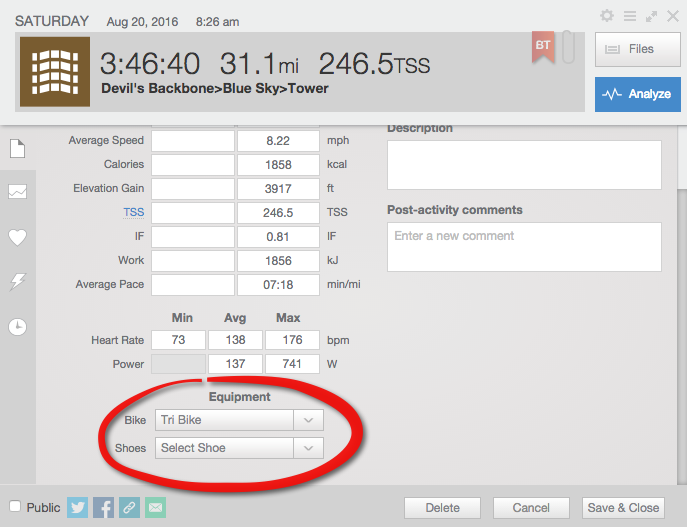 Enable or disable notifications such as uploaded workouts, comments from your coach, or suggested threshold changes. Most of the metrics in TrainingPeaks are based off of threshold so it is important to make sure you keep this up to date! Set your thresholds and zones for each sport you train for. Note: if you do not set a threshold for a specific sport and upload that sport type 'default' will be used. Note: Setting your thresholds and zones is extremely important since all of the TrainingPeaks metrics are based on thresholds. Enable threshold notifications to receive an alert when TrainingPeaks suggest a threshold change. 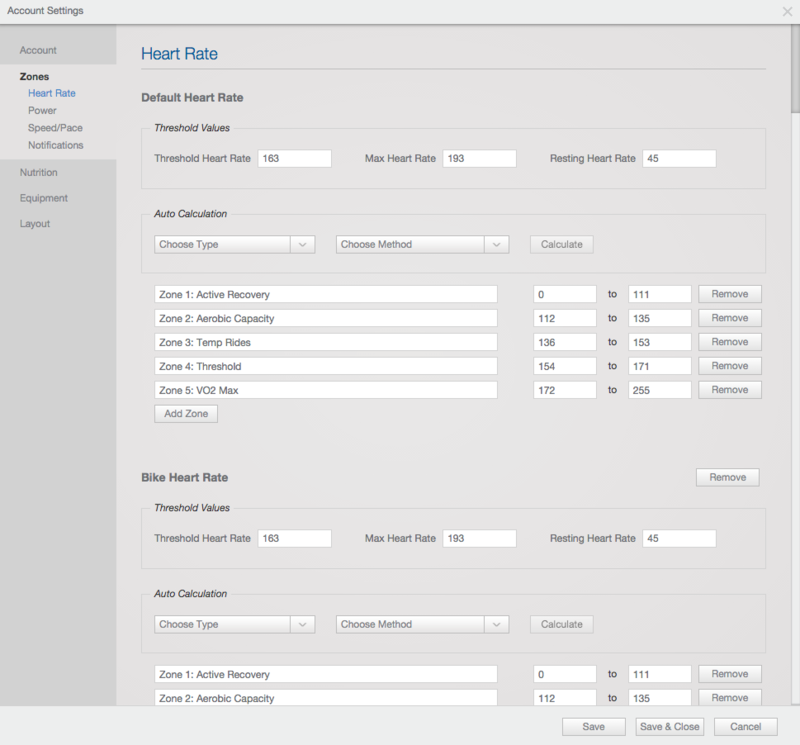 Enable "automatically apply" if you want TrainingPeaks to automatically apply your new threshold. Enter a daily calorie goal based on how many calories you want to consume exluding those that you would burn through exercise,. This number will be combined with the caloric expenditure from exercise and displayed in dashboard charts that display calories consumed vs calories expended. Connect your account to MyFitnessPal to automatically sync your meals with TrainingPeaks. Add bikes and/or shoes to track the mileage. 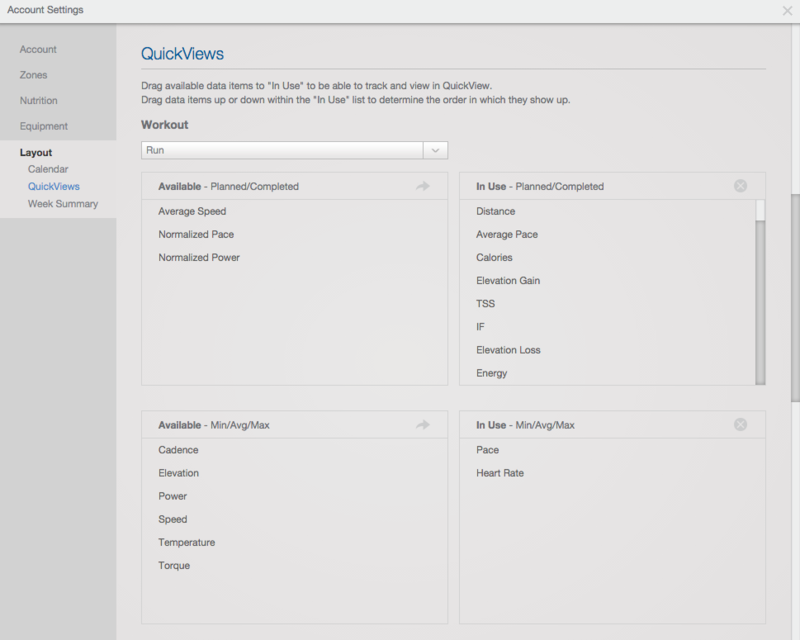 Equipment can be selected from the workout QuickView and mileage will automatically accrue based on completed workouts. 'Layout' allows you to customize what you see on your calendar, the week summary, QuickViews, and what metrics are available. Calendar - Workout: Moving data items from 'available' to 'in use' will make them visible on your calendar. Use less data items to save room on your calendar. Quickly see your compliance to the plan by turning on "Compliance". Completed workouts will colorize based on compliance with planned duration, distance, or TSS. Moving the data item up or down in the list prioritizes it with top being given top priority. Within 20% the workout will turn green, within 50% it will turn yellow, and over or under by more than 50% will turn red. 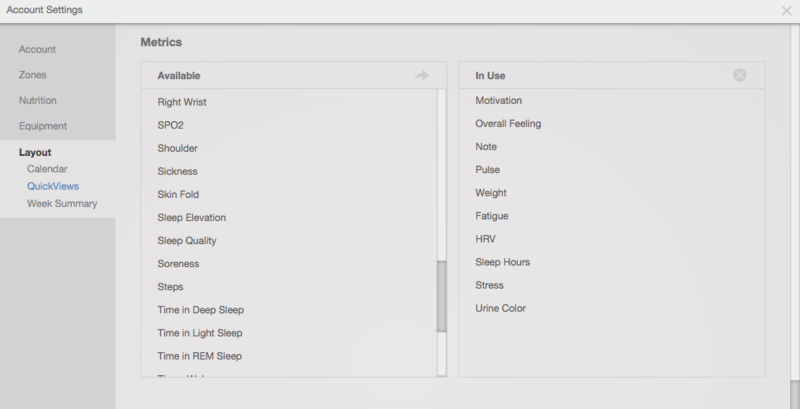 Drag items from 'Available' to 'In Use' to make those fields visible in the workout QuickViews. 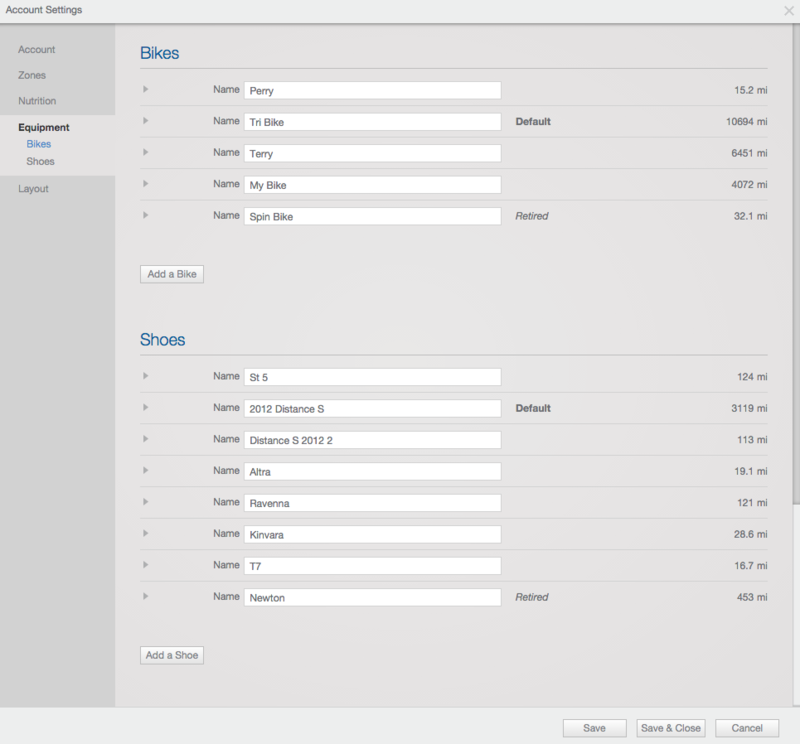 These settings are sport specific and allow QuickViews to be configured differently for different sport types. 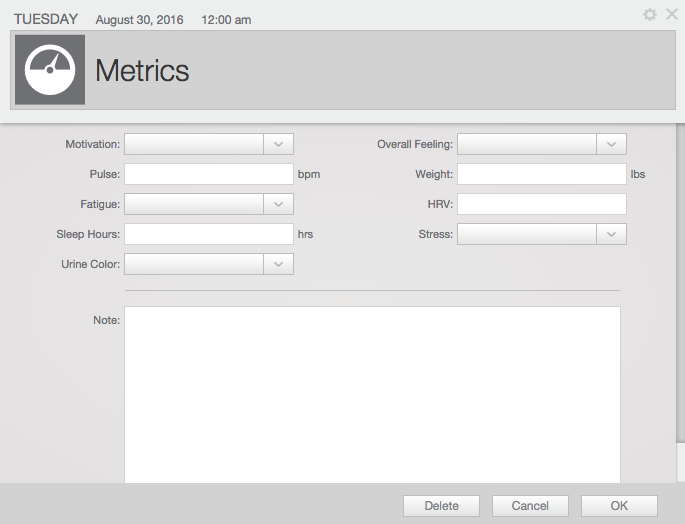 Drag metrics from 'available' to 'In Use' to make the metrics available when recording a metric on your calendar. Drag ATP items from 'Available' to 'In Use' to make them visible on the right side of your calendar to help with weekly planning. Note that you must have a completed Annual Training Plan (ATP) first for these items to appear. Click to use the Workout Builder to easily create a structured workout containing detailed intervals based on your individual threshold. Save a Workout to your Workout Library for future use. Drag and drop a file onto your calendar, the file will be automatically uploaded to the correct day. Download the original file, or recalculate the metrics after an update. 1. View the number of weeks until your next 'A' priority event. 2. View all upcoming events or add a new event. 3. See your goals or set a new goal. 4. View your upcoming workouts. 5. Review today's Fitness, Fatigue, and Form as well as ramp rates for given durations. 6. Review the training zones associated with your upcoming workouts. Use the dashboard to monitor progress and track trends over time. Drag and drop charts to your dashboard from your charts library . Customize charts under under settings . Add the same chart multiple times but customize it to view the data for different date ranges, sports, or in a different way. The Performance Manager Chart allows you to model your Fitness, Fatigue, and Form to help you plan the perfect peak for your goal Event.